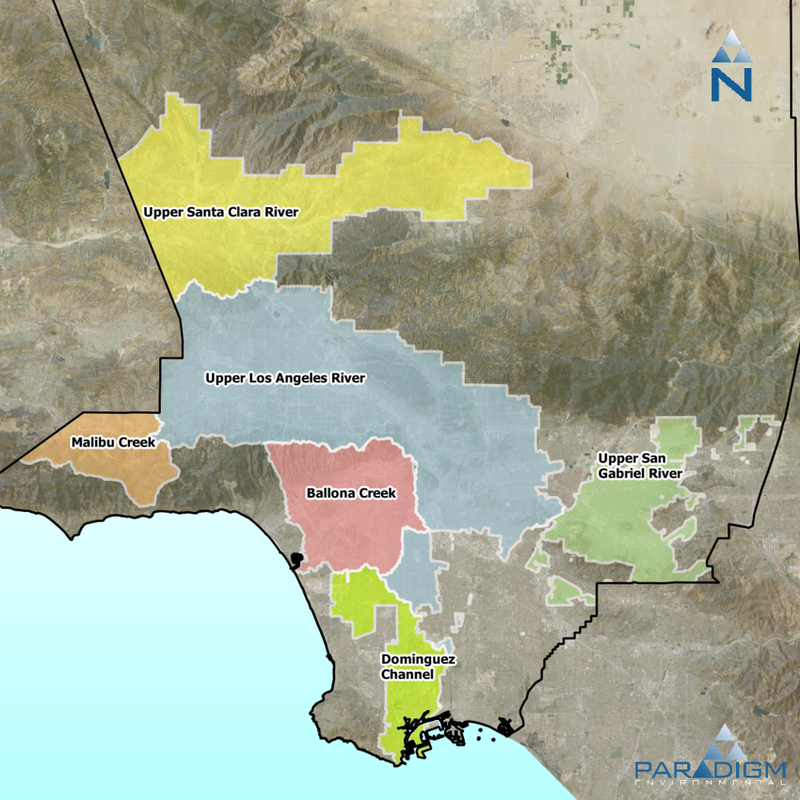 Paradigm led the modeling for 10 Watershed Management Programs (Programs) across Los Angeles County on behalf of 54 jurisdictions for 43 receiving waters (see map below for group boundaries). These EWMPs are considered the most advanced stormwater quality implementation plans developed to date in the United States (and beyond). Each Program included a customized menu of structural BMPs and source control programs for each jurisdiction, including low impact development, green streets and regional projects. Continuous simulation models were used to establish current conditions and identify cost-optimized strategies for capital improvements. Each jurisdiction received a detailed “recipe for compliance” that charts forward the next 25-years of stormwater capital improvements and associated costs (both capital and O&M). Cost optimization with SUSTAIN evaluated millions of scenarios for each jurisdiction and identified targeted strategies to implement BMPs. Baseline/current condition modeling with LSPC included detailed calibration across a 10+ year continuous simulation period for hydrology, sediment, metals, bacteria, nutrients, and more. The Program approval process included detailed review of modeling input and output files by the state regulatory agency; while some Programs faced multiple heavy revisions or disapproval, Programs developed by Paradigm received limited comments and set the bar across the region. The Programs are now being actively implemented and Paradigm is now supporting the jurisdictions with tracking, reporting and implementation.